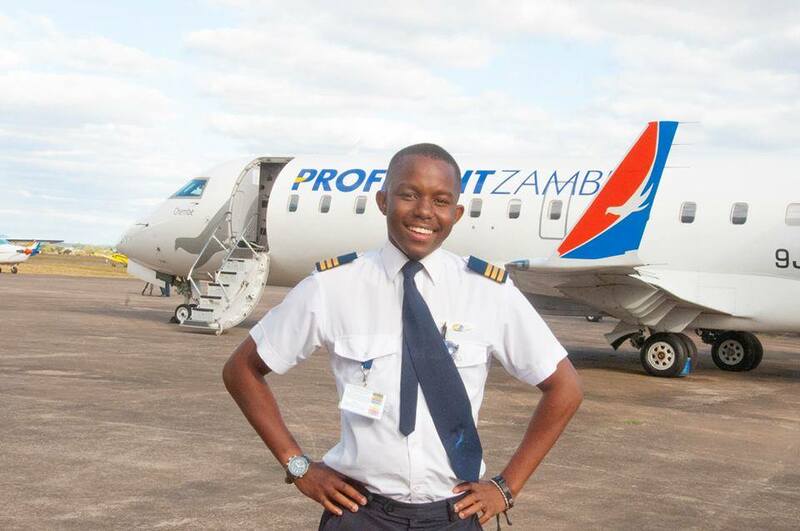 Zambia’s youngest commercial pilot Kalenga Kamwendo has clocked 1,000 hours of flying with the countries’ leading scheduled airline Proflight Zambia. The 21-year-old First Officer reached the milestone while on an early morning flight from Lusaka to Mfuwe last week, just one year and nine months after he started flying for the airline. The achievement brings him closer to the 1,500 hours mark, at which point he can sit exams to achieve his Senior Officer licence. With a further 1,000 hours under is belt he can apply to become a captain. Kalenga joined an elite team of pilots flying for Proflight Zambia on routes from Lusaka to Livingstone, Mfuwe, Lower Zambezi, Ndola, Solwezi and Kasama, as well as Mbala being lunched on June 28 this year, Durban in South Africa and Lilongwe in Malawi. Proflight Director of Government and Industry Affairs Captain Phillip Lemba, said that for any new pilot, reaching 1,000 hours is a benchmark, as a pilot’s experience is not measured on the years he works but the hours he flies. “It’s quite a milestone for Kalenga, I encourage him to be level-headed, well composed and focused on his career. We as Proflight Zambia praise our young pilots for the hard work he has demonstrated from the time he started as a commercial pilot a year ago,” Captain Lemba elaborated. “Kalenga’s 1,000 hours remind me of the olden days when I got my 1,000 hours, 46 years ago. When I got my 1,000 hours I was still in the Zambia Air Force. Those days in the force it was a great millstone and achievement; with my friends and colleagues we celebrated together. I have flown over 20,000 hours in my lifetime, hence my young man Kalenga still has a broad road of adventure and hard work ahead of him,” he added. The number of hours flown by pilots is important, but there are also regulations restricting the total number that can be flown in a given period to ensure safety. “I have learnt a lot from the Proflight family and am happy to be part of the many achievements the airline has accomplished. Great expectations await me and am surely proud to be part of Proflight at 25 years,” said Mr Kamwendo. I cannot see anything to be proud of here. Indeed bus drivers have clocked thousands of kms between JHB and LUSAKA. What is ka 1000 pa kandeke? Bika Bola panshi mufana. An aeroplane is simply a car that you drive in the air. So where is the achievement here? Make noise for a minibus driver who was a conductor for three months and started to drive thereafter. Its more challenging to drive on land than to fly in the air. There are no pot holes, no traffic jam, no RATSA and corrupt traffic police, no car jackers, no road rage, no tippers to endanger your life, no tyre burst etc. The boy is doing fine but it shouldnt be a news item. Zambians ufontini. Getting exited over everything. That is why you believe that it is Lungu and Kambwili who built you roads, schools and clinics when it is your tax. Ka chitole aka nako twanaka nako. It is politics time now ba LT not ifyamafi ati 1000MILE ….so what. Tell us the running mate for HH. @1.1 AND OTHERS, BECAUSE HE IS YOUNG AND DEDICATED TO HIS JOB. EVEN HE WERE DRIVING A BUS OR TRAIN AT HIS AGE, HE WOULD HAVE BEEN EQUALLY, CONGRATULATED. THE YOUNG MAN IS DEDICATED TO HIS JOB. CONGRATULATIONS, YOUNG MAN AND KEEP IT UP. YOUNG MEN AND WOMEN WILL BE EMPLOYED BY THE NEW ZAMBIA NATIONAL FLAG CARRIER IN JUST FEW MONTHS TIME OF ECL’s VICTORY WHEN THE NATIONAL AIRLINE IS REFORMED. THE FRENCH GOVERNMENT WILL USE AIRBUS THE FRENCH COMPANY THAT DESIGNS AND MANUFACTURES AIRCRAFT TO BEEF UP THE NEW AIRLINE, TRAIN PILOTS, AIRCRAFT AND RELATED ENGINEERS, AIR TRAFFIC CONTROLLERS, CABIN CREW MEMBERS, ETC. WE NEED YOUNG PROFESSIONALS LIKE KALENGA TO BE MANNING THOSE AIRCRAFT ON TOTALLY NEW AND OLD ROUTES SUCH AS PARIS, BEIGING, NEW YORK, LONDON AND OTHER ROUTES LIKE TO MALAYSIA, ETC. BRASE YOURSELVES FOR THE CHALLENGES IN PILOTING, AIRCRAFT ENGINEERING, AIR TRAFFIC CONTROL, CABIN ATTENDING AND MORE, YOUNG MEN AND WOMEN. where’s the achievement here? A lot of bus drivers have clocked thousands of hours already. Gone are the days when being a pilot was something special…that small boy can’t even solve the complex engineering mathematics that some of us have been able to demystify over the years….and we are not even talking about it. Through what we have done we have changed the course of our families which ordinarily would have been languishing in abject poverty….through our illustrious careers we have made smart investments and the future is secure. SO, INSTEAD OF GETTING EXCITED FOR CLOCKING 1000HRS, I WOULD ADVISE THE YOUNG MAN TO FOCUS ON MAKING INVESTMENTS THAT WILL GUARANTEE A DECENT FUTURE FOR HIMSELF AND HIS FAMILY. HE HASN’T ACHIEVED ANYTHING YET! Ba Tayali nga imwe finshi mwacitapo other than ukupanga icongo pa social media. Mukafwa na jealous bambi imwe!!! Mulekeni umwaice. If 1000 flying hrs is not a big deal to you what is? @Tayali: What have you achieved in your long and old life? Nothing but cleaning toilets wipping old people’s bums to eke a living in Europe! You are such a disgrace! no wonder you idio.ts will remain in poverty. i hope chakolwa wins again this year so you mother fuc.kers continue suffering! Well done Kalenga and keep us flying mwaice. I look forward to boarding your flight in Nov this year again. Why do people find it hard to appreciate something extra ordinary?. Can one compare flying and bus driving? Go on young lad and became a captain then big airlines like emirates, KQ, ET, SA and so on can employ you to fly Dreamliners and the Boeing 777-300ER. The last captain we had is captain Mulundika flying the super DC10 famously called NKHWAZI. Forget comments from morons with no aviation knowledge. Well done Kalenga! We are counting on you to make us proud. Keep the focus, learn about the legends of aviation in Zambia such as Captain Mulundika, late Captain Justine Lusambo and late Captain Rank Ng’andu. You will go far and make Zambia a reference point for aviation. Congratulations and all the best!!! Well done young man, my 18 year old son hopes to become a pilot one day:) You are an inspiration! GREAT JOB YOUNG MAN SOME PIPO HAVE NEVER BEEN APPRECIATED FROM THEIR HOME NO WONDER IT IS HARD TO APPRECIATE OTHERS MORE OVER THE AGE IS A MOTIVATING FACTOR ON ITS OWN, BIG UP TO YOU BOY-MAN! Well done young man. I am rather disappointed with Director Phillip Lemba, who tried to hijack the young man’s incredible achievement by trying to talk about himself and his 20 000 hours. I was thinking the same thing. Why overshadow the kid by telling your history? Some people..
Kalenga you are an inspiration to young Zambians and the nation at large. Zambia is proud of your achievement, continue doing the good work you are doing. Don’t listen from armchair critics who are good for nothing, but criticising everything just because they are failures in life. Keep flying the Zambian flag high mwaiche, the nation is behind you. Ifikopo lyonse tafimona ubusuma, fisusha nechiweme, its really shameful. Keep it up Kalenga. Well done young man, sky is obviously not the limit for you. Chief blogger miyanda, what have you got to say about this feat. Say something, do not just bore us with classroom essays. Well done to the young man. Hope you can inspire many to go into the profession. How someone can compare driving a bus to flying just shows the latent ignorance we still have in our country despite over 50 years of independence. It’s really a shame that some people still haven’t moved on with the times. Again, well done and continue spending your time doing something productive unlike some on here who have too much time on their hands and only come here to vent their frustrations. Ignorance is not bliss. The young man is an inspiration and is still building his career. Its astonishing that some bloggers are already dismissing his calling. What do you want? If one is a Kaponya you criticise, when one trains and and becomes a pilot at a young age, you criticise. It’s also so shallow to make comparisons with driving a minibus. Everything has safety issues – but try being up in the sky and having to make vital decisions when there is a computer or structural failure of some sort on the plane. Ah! Just one thousand (1,000 km), have clocked over 40,000 km since I started driving. JUST joking, ON a serious note young man you an inspiration to our Great nation, Zambia. I am sure you are a role model to a number of young people who are looking up to you, keep it up. Remember miles or Kms alone are not enough, dedication, respect and good work ethics will propel you even further. Congrats young man keep it up. Am looking forward to being on your flight one of these days. Well done lad.Reading about you brings joy to my heart.You are a shining light in the deep wilderness called Zambia full of illiterates and flybynight politicians who bribe the opposition to withdraw their candidature on nomination day.Keep it up,our little sons are inspired by your story. Congratulations Kalenga, continue flying higher. Hello? I am still calling on the retired general Miyanda to congratulate this young man. At least show us that you can do something else apart from writing essay after essay. This one just needs a few lines, finish. Jealous is the animal that kills Africa and Africans. What a pity for some of these shameless commentators here! God bless you young man and be an example to many young ones to look to you! Its okay 1.1 since no one like you here either! Imwe lolo,research first,who is Kalenga Kamwendo.I hope this is not another relative to the minister of works & supply or another son to a ZAF general,using our Eurobond money to sponsor their families,then come back to shine on us.The boy must be arrested together with his father.The boy was definitely pushed in there and chances are that he is there on our tax payers money and even worse if its the Eurobond money.Fufuzani bane-these are criminals coming out in form of self achievements when infact its stolen money they flying on.It will be sad when youu find out the real story behind. Here is my brief research find out more guys:Nebut Kamwendo was at Ocean basket-arcades. April 4, 2013 · Lusaka, … Nebut Kamwendo Miss u more love. April 4, 2013 at 12: … Zaf Lusaka Air Force Base.Billiot B Tembo with Rhoda Simwatachela and 4 others at ZAF Air Base Livingstone. … Nebut Kamwendo added a new photo — at ZAF Air Base Livingstone. So this boy is nothing to celebrate about.Even when my info above may not be factual but he definitely was put there,just like Lungu said all ministers stay! Here is officially factual info,atase imwe viba PF mwilatubepa sana ayi-Fimafi: The father of this boy is known as Thomas and his mother Mailes.And Mr.Thomas Kamwendo is the chair of the corrupt Copperbelt Development Foundation.Here is an article below that i earthed from Lusaka times:”Thomas Kamwendo and his wife Mailes (c) with First Lady Dr Christine Kaseba during their 25 th Wedding anniversary at Mulungushi International Conference Centre on December 14,2013. Dr Kaseba was the matron”.I found this news here on Lusaka times.So this chi Kamwendo is related to Christine kaseba.You see now what i was saying?Our Eurobond money-gone!!!!!!!!!!!!!!!!!!!!!!!!!!!!!!!!!!!!! !